Dustin Lee Reed, 2061 Bradyville Rd., Readyville, was charged with Aggravated Domestic Assault, DUI 3rd Offense and violation of the Ignition Interlock Device law on Jan. 18 by Cannon County Sheriff’s Sgt. Randy Neal. It is alleged that Reed, while in an argument with the purported victim, grabbed her around the throat with his hands while she was in the process of calling 911. Reed then left the residence where the alleged assault occurred and was stopped on Bradyville Road. He was operating the vehicle without an ignition interlock. 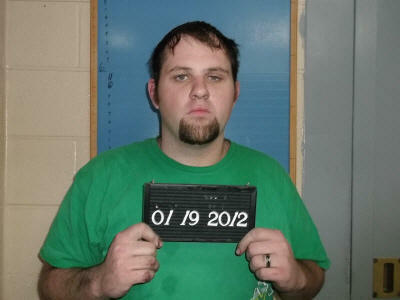 He is under a court order to have the interlock device on his vehicle until Feb. 12, 2012. Bond was set at $8,500. Initial court date is Feb. 7. Sgt. Neal was dispatched to 1789 Lassiter Road for an open 911 line. Cannon County Dispatch advised that a female caller stated she needed the law quick, and dropped the phone, and that they could still hear yelling in the background. Sgt. Neal arrive at the location along with deputies Steve McMillen and Eric Moss. Sgt. Neal spoke with Sandra Lee Reed who stated her son, Dustin Lee Reed, was who she had called about but he had left the residence. She said he just left and was driving a green Chevy truck. Sgt. Neal asked Deputy McMillen to get a statement from Sandra Reed and left to try and located Dustin Reed. Deputy Moss advised Sgt. Neal the truck in question appeared to be coming out of the road next to the residence. Sgt. Neal saw the truck and made contact with it as it was turning into a residence on Bradyville Road. The truck went behind a barn at the address and stopped. Sgt. Neal asked the driver to exit the vehicle and observed that the person was the subject being sought. Sgt. Neal could smell an odor of alcohol and asked Dustin Reed if he had been drinking. Reed stated he had been. He said he was at his mother’s house because she was trying to take his daughter from him and that he got upset with her. He said he put his hands on her because he was mad and drunk.